Children at Gelli Primary School said a big thank you to Taylor Wimpey this week after the housebuilder answered their call for construction materials. 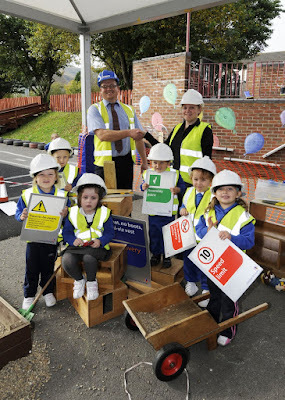 Each year, Gelli Primary School embarks on a school-wide project to learn about a selected career and this year the children chose construction. Over the next few months, the school will learn more about the industry including the materials needed to build new homes, the dangers lurking on building sites, the health and safety measures which must be practiced on developments and what is required to pursue a career in construction. To help with the project, Taylor Wimpey has supplied signage and materials to create a construction display at the school. The housebuilder has also supplied six high visibility vests and hard hats, for when the children visit Taylor Wimpey’s Llewellyn’s View development later this year, to hear what’s involved in construction from site manager Mark Thomas. Llewellyn’s View is a development of just 61 homes located in the picturesque village of Gilfach Goch. Providing modern living right in the heart of a rural community, the development offers residents stunning views of the Rhondda Valley. As well as being surrounded by the glorious Welsh countryside, Gilfach Goch village has local shops, including a post office, to meet everyday needs whilst the larger towns of Tonyrefail and Pontypridd are nearby. Transport links are good with the M4 just seven miles away providing easy access to the towns and cities of South Wales. Cardiff is within commutable distance, just 16 miles away. For further information, visit the marketing suite, now open daily from 10.00am to 5.00pm, or call 08456 724 005. Alternatively, log on to www.taylorwimpey.co.uk. We're very good at "blowing our own trumpet" at Gelli Primary School. We have introduced a new feature on the school website - a picture galary where you can see some of the activities that our children participate in throughout the term. Click here to visit it or go the the Gelli Primary School website site map for future updates. 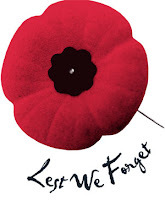 The Gelli Primary School Choir, under the directorship of Mr. Jamie Evans will perform a Remembrance Day service in the School Hall on Wednesday 11th November at 6.00 p.m.
A poster advertising the service can be downloaded from here. This will be the School Choir's first public performance, so if you are able to support them please do so. This year we celebrated our Harvest festival with a visit from the children's charity Barnardo's. Mrs Meeks told us about the work that the Barnardo's volunteers undertake in Wales to make the lives of the children who are less fortunate than us better. We organised a coin collection and each child who donated some money will be presented with a certificate of thanks. In addition Mrs. Meets left us Barney, the Barnardo's mascot. He will stay with us in school as a token of thanks for our donation. The class who has the best weekly attendance percentage will look after him. 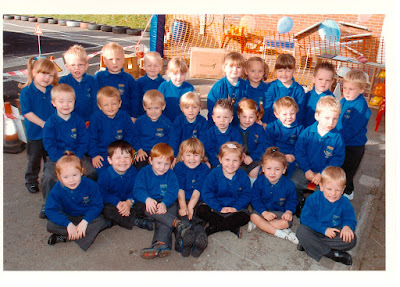 Last week the Rhondda Leader photographer came to school to take photographs of our new nursery class for a feature that they run every year called "New Starters" Our photograph should appear in the newspaper in the coming weeks. I have received a letter from the photographer informing you of your opportunity to purchase an 8 x 6 colour print in an attractive frame for £6.00. He has said that the school can retain 10% of the money sales of their photograph raise. Please send your order along with a cheque payable to M Gunton.